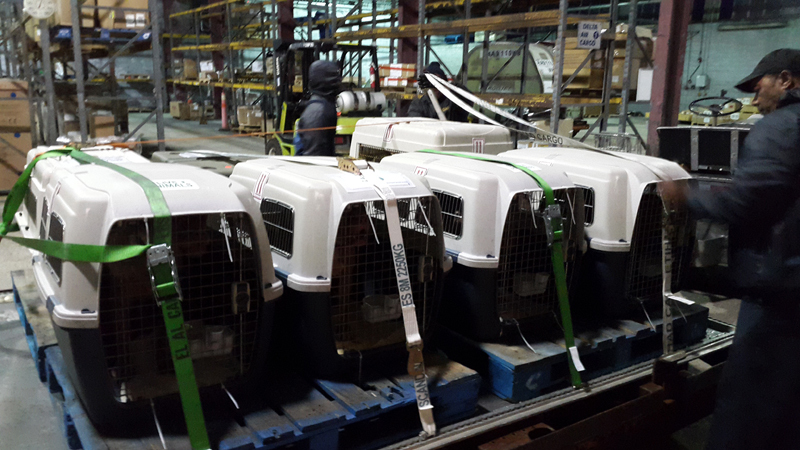 Yesterday evening seven ‘illegal’ dogs were flown overseas via Cargojet in the hopes of finding them new homes in the United States. “This initiative was led by the Ministry of Home Affairs and a nonprofit no-kill rescue organization in Massachusetts called ‘Angels Helping Animals’, who came together to find an alternative to euthanizing the dogs,” a Government spokesperson said. “I was passionate about finding a humane solution to this issue,” said Minister Brown. “All of these dogs are illegal dogs and have come into our custody over the past few months. They are all pit bull type dogs and therefore a prohibited breed which cannot be rehomed locally. “Although flying the dogs off the island is the most efficient way of exporting them quickly and safely, the cost can be expensive. However, the rescue group is working to cover these expenses with the help of donations as well as volunteers in both the United States and Bermuda. “It’s been an incredible team effort to save these dogs,” said Minister Brown. “The dog wardens have worked tirelessly to care for these dogs since they came into their care. They handled the daily care of the dogs, the vaccinations, securing the transport crates, socializing some of the dogs and preparing the dogs for transportation. “The pit bull has been prohibited from breeding in Bermuda since 2003. 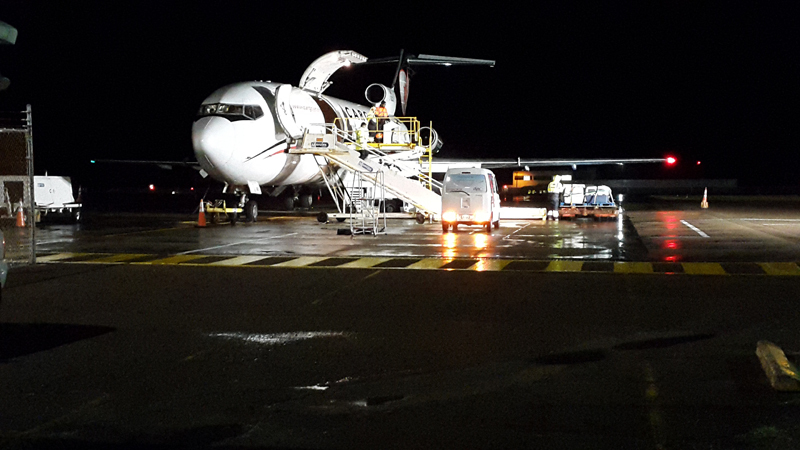 The Cargojet departed Bermuda for Newark at 7pm last night. As soon as the dogs landed, they were taken into the care of ‘Angels Helping Animals’. ‘Angels Helping Animals’ have rescued and placed more than 400 dogs in the past three years from The Virgin Islands and throughout the United States. Why do we still have illegal breeds in Bermuda? Did the Minister not announce in September that he was abolishing illegal breeds? Rather than shipping the poor dogs overseas, can we ship the irresponsible owners overseas instead? We have illegal breeds to keep people and their pets safe. The Minister did not announce that he was abolishing illegal breeds – he opened the door for a discussion about how moving dogs from the Prohibited List to the Restricted List would affect the Community. Based on the fact that he’s just used our money to ship 7 dogs off the island I’d say he’s not made a decision. Here’s a novel idea….instead of shipping irresponsible owners off the island why don’t we report this behavior so that people can be prosecuted/fined so that THEY can pay for the export of these dogs? I for one, am tired of paying for stupidity. Absolutely! Their fine should cover the cost of relocation. They didn’t ask morons to breed them. Don’t inflict your biases and problems on us. Would you rather a pitbull chew off your childs face? Always a complainer. All dogs can ‘chew off your child’s face’ as they all have teeth. Should we ban them too? Stop making ignorant analogies. Pitbulls are inherently violent dogs. That is a fact. And since their rise to popularity they , as individuals , have maimed and killed more people and pets than all the other breeds combined. Coincidence ? Bad owners ? Or something else ? Where are your facts to back this up? You’re just stereotyping with the Pitbull reference and like Pisces girl said below all breeds with teeth can chew your face off. Why should MY HARD EARNED MONEY be used to send OTHER peoples dogs off the island without questioning the public first?! Or not using the original owners funds to pay for the trip?! When was the last time that happened? As far as I’m concerned other dogs besides the banned breeds have attacked dogs here too and done as much damage! Sit down already…. All breeds with teeth aren’t inherently violent or aggressive the way pitbulls are. Stop acting silly. You sit down. Better yet go hug a tree. I don’t want pitbulls here. I don’t care if they use tax dollars to send them away. Pitbulls are a danger to all of us, especially small children. They are the #1 culprit. Try thinking about someone other than yourself for once. You dog loving weirdos can kick rocks. Your statements just prove how inherently ignorant you and this whole law is. Firstly there is no such thing as a pitbull breed. The name is a stereotype of certain common dogs like Bull Terrier, American Staffordshire Terrier, American Bully Staffordshire Bull Terrier and The American Bulldog. These dogs are not and have never proven to be inherently violent. In fact there is no such thing as an inherently violent dog. Dogs are inherently pack animals so the Alpha of the pack is who they follow. Since dogs are domesticated they have human alphas. If the dog has violent antisocial traits then it’s something that has been conditioned by their alpha. The dog owners are the #1 culprits not the dogs. Any dog can attack a child if they have not been properly trained. These banned breeds have been used as search and rescue dogs, actors, television personalities, seeing eye dogs, and celebrity pets. The American Staffordshire Terrier, Pete the Pup from the movie Little Rascals, Billie Holiday’s companion “Mister”, Helen Keller’s dog “Sir Thomas”, Buster Brown’s dog “Tige”, Horatio Jackson’s dog “Bud”, President Theodore Roosevelt’s “Pete”, “Jack Brutus” who served for Company K, the First Connecticut Volunteer Infantry during the civil war, Sergeant Stubby who served for the 102nd Infantry, 26th (Yankee) Division during World War I, and Sir Walter Scott’s “Wasp”. Weela, who helped save 32 people, 29 dogs, 3 horses, and 1 cat during southern California’s widespread flooding in 1993; Popsicle, a five-month-old puppy originally found nearly dead in a freezer, who grew to become one of the nation’s most important police dogs; Norton, who was placed in the Purina Animal Hall of Fame after he rescued his owner from a severe reaction to a spider bite;Titan, who rescued his owner’s wife, who would have died from an aneurysm; D-Boy, who took three bullets to save his family from an intruder with a gun; Star, who while protecting her owner was shot by police in a video that went viral; and Lilly, who lost a leg after being struck by a freight train while pulling her unconscious owner from the train tracks. Thank to dog loving weirdos so many lives have been saved. Didn’t read. You can kiss your dogs in the mouth and roll around in bed with them but us normal people aren’t that obsessed or nasty. If you care so much you can move overseas and adopt those 7 pitbulls. Be sure to give me a ring when they rip your kids throat out as they are prone to do. Well I’ll be honest I actually dislike dogs, don’t own them, but you shouldn’t punish a breed just because bad stuff has happened before (with other breeds and dogs as well). It’s unfortunately up to the owners how their dogs behave. My friend has had a pitbull for his whole life, plays with babies, is the sweetest thing ever and nothing as ever happened and nothing will! It’s how you raise it, I understand your point but your being overly biased and judgmental as a lot of us are! Well sign up for your tax dollars to be used and not mines! If pitbulls are as big of a danger as your implying why haven’t I or the thousands of other people in Bermuda been attacked and killed yet? Maybe a handful of times a year not even….keep on harping on baseless information. Yes, I’m sure that all the people who ended up in court being prosecuted for their PB’s attack on someone else or their pet believed the same thing . And not a single one of them ever admitted to being a bad owner either. Good owners who break the law and illegally breed them and sell them ? The only dummies are people who keep saying that they’re wonderful , safe and loving dogs when all statistics day otherwise . And still no-one has ever admitted being a bad owner . Get out of the denial . How many of them do you own ? Judging by the way you come across it sounds like you’re using them to prop up a crack habit . How many babies have you pumped out. None. How many have you pumped out and don’t care for or raise? I’m guessing 4-5. You love your pitbulls though. Makes you feel “gangsta” doesn’t it? Compensating for a lack of something are we? No, I think the preference would be for people to obey laws. A lot to ask in Bermuda these days. Certain parts of the population think laws only apply to other people. Why would an overseas rescue foot the bill to have MORE dogs shipped to their country? Someone show us where the money is coming from – bet these dogs had all their health checks and vaccines using OUR money….anyone know what a rabies vaccine for one dog costs?? I do – its not cheap. Times that by seven dogs add all the other miscellaneous costs THEN the airfare. Yes Minister Brown, please give yourself a pat on the back for a job well done (NOT). Why aren’t we prosecuting the people who are breeding these dogs? Make them pay the export fees. Last I checked they are still a PROHIBITED breed, what don’t people understand about that word? Just because they “might” be legal in the future doesn’t give anyone a pass. Suppose weed “might” be legal in June..does that mean if I go to court today for possession that I’ll get off? Now let’s change the dog laws. Mean while we have ppl who go without food. Funny how people fear this bread. No such thing as a bad dog. Just a bad owner lol. A lie constantly perpetuated by dog lovers. They are unpredictable. No such thing as a good pitbull. Funny how 41 countries have determined they’re so full of bad owners they won’t allow them ! And the US and Canada are reportedly the only places that allow their import . No such thing as a good plp either. You are just obsessed with the PLP aren’t you…quite intriguing I might say. many other breeds that should be illegal are legal LOFL Berms a joke. Absolutely. Would like a follow up article about what fines the owners have faced and whether they are cooperating to turn the breeders in. Pitbull are supposedly “dangerous” n banned but I’m allowed to have a Rhodesian Ridgeback( used to kill lions in Africa). I’m allowed to have Doberman Pinchers (more unpredictable than a pitbull) or Rots and Shepards( Vicious Guard Dogs). Bermuda laws are jokes. I can make Labradors vicious so why not legalize pitbull n make owners responsible for bites n securing their pets just like any other breed of Dogs? It has more to do with the persons who own those types of dogs and how they breed them. Not the instinctual nature of the dogs. Kinda common sense if you take the time to think about it. Sorry, I think you have bought into the “bad breed” propaganda. I have had a German Shepard, a Doberman Pincer, a pit bull and a number of other dogs and the only one that was particularly aggressive was a “Bermuda bitsa”. When they hit that cod weather they are going to wish they were back home. As a dog lover I applaud Mr Brown however I’m still amazed that we have illegal breeds given the time frame, I would have thought that any remaining from the amnesty would be old age pensions by now. It may be seen as a nice gesture, but yeah I think the funds would have been better spent training up mechanics to repair our buses for example. C’est la vie. Thank you ministry of home affairs. I will be making a donation. Maybe the Minister should make travel arrangements for our nice gang members they don’t bite they kill. Maybe that’s why all of my neighbours have been broken into and not me and why i own Licensed PITS CAN’T TELL YOU THE LAST TIME I LOCKED MY DOORS don’t even know where my house keys are. But i must commend the Minister actions he has a heart and i can see that he is far from being closed minded the killing of these dogs is not the the answer and the exportation is not the answer but is better than euthanizing anything that LOOKS LIKE A PITBULL TYPE DOG. CAN SOMEONE OUT THERE SHOW ME AN EXAMPLE OF A PITBULL TYPE OF DOG. IS A LABRADOR STAFFY MIX A PITBULL TYPE OF DOG HELL NO IS A BOXER LAB CROSS A PITBULL TYPE OF DOG HELL KNOW. We should be able to own any dog the we like but be solely responsible for its actions. People get ya facts straight about the PITBULL 90% OF THE SO CALLED PITTS IN BERMUDA don’t even have Pit in them what we have here is a bunch of crossed up mutts that have the appearance of a Pit……………. prove me wrong and i will be quiet. What Breeds Have the Strongest Bite? Below are the top 10 dogs with the strongest bite in terms of PSI (pound per square inch or pound-force per square inch), as reported by PetComments.com. This list is not indicative of any specific animal and should only be viewed as a scientific study. We certainly recognize that there are many well behaved and sweet dogs of these breeds, especially when paired with responsible owners. This isn’t about bites. Its about kiling other dogs and children. Pitbulls are the #1 culprit. Get over it. You can have another dog. You don’t need a pitbull. I love Pit Bulls and would love to have one or two and I agree with the thought that it isn’t the breed it is the owner. I’d like a lion as a pet. Perfectly safe around kids. Can give a nasty bite, but then so can a Chihuahua. And if it does attack someone and rip their face off, that will come as a great surprise to everyone. More money spent stupidly by PLP. Guess dogs come before people. They’re pandering to their base. Guess you guys have nothing to talk about as you wind down your day in the office. Enjoy your evenings out in Hamilton et al. Hopefully your overseas deposits will work out whist family be like Port ah…..Barbados… St. Lucifer…. The pits jaws lock…ask a vet why…you have to lift the pit by the hind legs to get it to let go. According to a very highly regarded local vet Pits do not actually have some jaw locking mechanism . They’s simply so hard headed that once they grip they will not let go until they have destroyed their victim. And I don’t know where you got that lifting the hind legs thing from .. another old wive’s tale ? You actually have to strangle them within an inch of their life to get them to let go . All this money spent on killer dogs. Yet never a penny from pit bull advocates for all the thousands upon thousands of victims of these dogs. Why not put the money towards helping all the victims instead?